Dandelion weeds are a nuisance for any lawn. They spread quickly with the wind when they turn into the well known white puff ball made completely of seeds. The weeds also have a deep root system which keeps them coming back year after year even if you pull up the top portion of the plant. When faced with a dandelion problem, there are ways that you can reduce the number of plants or even get rid of them. You just need to have the time and patience for it. Pouring vinegar on dandelions will kill the top of the plant easily. In most cases, it will also succeed in drying out the entire plant down to the root. You must, however, pour it only on the weed. The vinegar can kill other plants as well, including those that you don't want to hurt. Use a spray bottle if you want to direct the vinegar more accurately. You can add salt to the mix if you are killing weeds in an area where you don't want anything to grow, such as a patio. The salt will make the soil unfit for growth for an extended period of time. Do not think that you are going to kill a dandelion by pulling it out of the ground. You will succeed in removing some of the plant, but the weeds roots run very deep. It will just grow again. If you are considering digging the out of the ground, you will need to go down anywhere from 6 inches to a foot or more. There is a weed removal tool that you can try to use, but there are no guarantees that digging out the weed will work. Pouring hot water on the plants will kill them if you have soil that soaks water easily. You are basically cooking the weeds where they stand. Not many living things can withstand boiling water. If you have a clay soil that blocks water from being absorbed, this method won't work very well. You will kill the top of the plant, but the root system will stay intact. Spread gluten corn meal around the yard before dandelions typically pop up in your yard. The corn meal prevents roots from forming, so this works well at keeping the dandelion seeds from growing new weeds in your yard. When the yellow flowers of dandelions pop up, try mowing to take the heads of the flowers off. If you don't need to mow, but have the time, you could also pull the heads off of each dandelion. This will keep the weeds from turning into the white fluffy seed head. 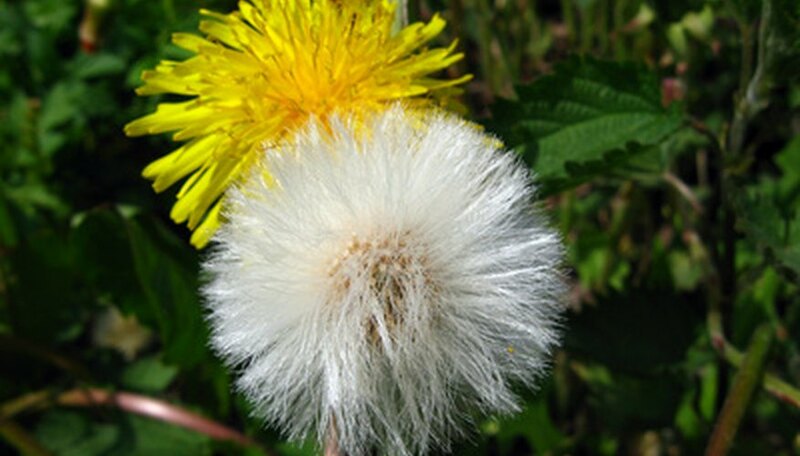 Keeping the seeds out of your yard prevents future dandelions from growing.